Fiction – paperback; Scribe; 288 pages; 2012. A couple of years ago I read Cate Kennedy’s The World Beneath, which won the People’s Choice Award in the NSW Literary Awards in 2010. Set in Tasmania, it was about a divorced couple who had been involved in the Franklin River Blockade of 1982/83, in which a group of non-violent protesters occupied a proposed dam site in a World Heritage site. But Kennedy isn’t just an award-winning novelist. She has produced several poetry collections — one of which won the Victorian Premier’s Literary Award for Poetry in 2011 — and a travel memoir. She is also an accomplished short story writer — her first collection, Dark Roots, was shortlisted for the Steele Rudd award in the Queensland Premier’s Literary Awards (before they got axed) and the prestigious ALS Gold Medal. Her latest collection of short stories, Like a House on Fire, was shortlisted for last year’s inaugural Stella Prize. 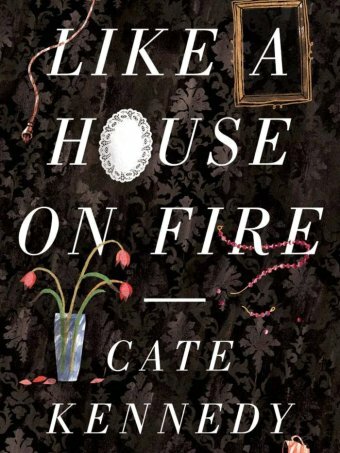 Like a House on Fire brings together 15 short but powerful stories, many of them set in rural Australia, and all of them about ordinary people thrust into extraordinary circumstances. There’s Frank, paralysed after a tractor accident, who resents his wife running his farm without him (Flexion); Rebecca, who spends her sick leave cyberstalking an old lover only to discover she’s got the wrong man (Cross-Country); and the pregnant woman dreading her next ultrasound because one time her doctor told her, “I’m so sorry I can’t see a heartbeat” (Waiting). The stories all explore the darker side of life, the tragedies, illnesses, disappointments and broken hearts we all confront at one time or another. But it’s not a depressing collection. Kennedy is very good at shining a light on the best of human nature and how small acts of kindness can give us the strength required to carry on. It’s the fleeting moments — a tender touch on an arm by a medical practitioner, the unexpected offer of help from a neighbour — which are often the most powerful. Poignant is the first word to spring to mind to describe the collection as a whole, but Like a House on Fire is also funny (in places), uplifting and life-affirming. I’m not a massive fan of short stories, but I loved every single one in this book. Yes, I really enjoyed this collection too. ‘Flexion’ and ‘Seventy-two Derwents’ were particularly good and have really stuck in my mind. I’m looking forward to trying her earlier collection, ‘Dark Roots’, soon. I am going to have to get this collection of stories. I love Cate Kennedy, both her writing and her personality. I did a writing workshop with her a couple of years back and she is the most down to earth person with such a sense of humour. This book looks wonderful. I’m keen to read Dark Roots, too, and am pleased to see the Kindle edition is available for a reasonable cost. There’s also quite a few used paperbacks going for just 1 penny! Interesting to hear she’s a lovely person. Her stories definitely have a warmth and humanity to them.